Over on the BitBucket code repository a new open source decoder for Inmarsat STD-C called Scytale-C has been released. The software is available for Windows, and a ready to use binary .exe file can be downloaded from the downloads section of the BitBucket repo. Inmarsat STD-C is an L-band geosynchronous satellite signal that transmits at 1.541450 GHz. This means that the signal can be received with a simple patch antenna, LNA and RTL-SDR dongle. The satellite is geosynchronous (stationary in the sky), so no tracking is required. On the STD-C channel you'll see messages mainly for mariners at sea such as weather updates, military operational warnings, pirate sightings/reports, submarine activity, search and rescue messages and more. If you are interested we have a tutorial based on other software packages available here which also shows some STD-C message examples. The tutorial can easily be adapted for use with Scytale-C instead. We've also seen on Twitter that Scytale-C beta tester @otti has noted that a SDR# plugin based on Scytale-C seems to be in the works. We feel that it is responsible to make a note on coding and licencing ethics about this software. Originally the software was illegally decompiled by 'microp11' from the closed source Tekmanoid STD-C decoder written by Alex and re-released in a different programming language with a different GUI as the 'open source' B4000Hz software. After Alex took action and micrcop11 realized what he did was wrong he took B4000Hz down. Since then microp11 notes that he has written Scytale-C fully from scratch without the closed source code knowledge. But to be unquestionably legal a full two man clean-room rewrite would probably need to be done as once knowledge of source code is acquired it can be difficult to think of a separate implementation (a somewhat related post discussing this on StackExchange). However, Alex has noted microp11's passion, and microp11's remorse at the initial decompilation and release of B4000Hz, and has decided to take the higher road and not pursue any further DMCA complaints. Instead he has kindly decided to allow the software to exist, but with acknowledgement of Tekmanoid included. We're glad that the matter was resolved amicably, but still if you use the Scytale-C software we would urge you to still consider the free or paid version of the Tekmanoid STD-C decoder to support Alex. This software [Tekmanoid STD-C Decoder] is closed source and has been since it was first released around 2009. At that time I made a choice to keep the source private but share the executable EGC app for free with the public, so that others could have some fun on the L-band! The "pro" EGC-LES version was developed in parallel the same year but kept private, nobody even knew it existed. Although I recognized its potential financial value I didn't take "advantage" of it. Firstly because it was a personal hobby project (can't put a price on intellectual property) and second, because I didn't want to help to further expose people's private communications to the open public. In February 2017 a raw clone of my de-compiled code was made public, to be later withdrawn with an apology. That is the moment I decided to release the PRO version as payware to the public. Many new features present in today's PRO version have been proposed by users and my aim is to satisfy everyone's wishes. Recently another similar project was released from the same author, with lots of documents to support the code and only minute traces of the initial de-compilation. This time one could indeed claim to have built it "from scratch" - codewise at least. The fact still remains that *part* of the knowledge (not 'code' necessarily) required to put it together was obtained from this initial reverse engineering process. Despite the negativity surrounding this case, I decided to withdraw my takedown request on the project in exchange for an acknowledgement to the original Tekmanoid decoder, as this person himself wished to include from the start anyway. To end it with another positive note, I can only hope this newcomer will bring something new to the scene, and that we will see some interesting things! Below is a video of the updated Tekmanoid decoder. I just want to let you know that scytalec is not a re-write. 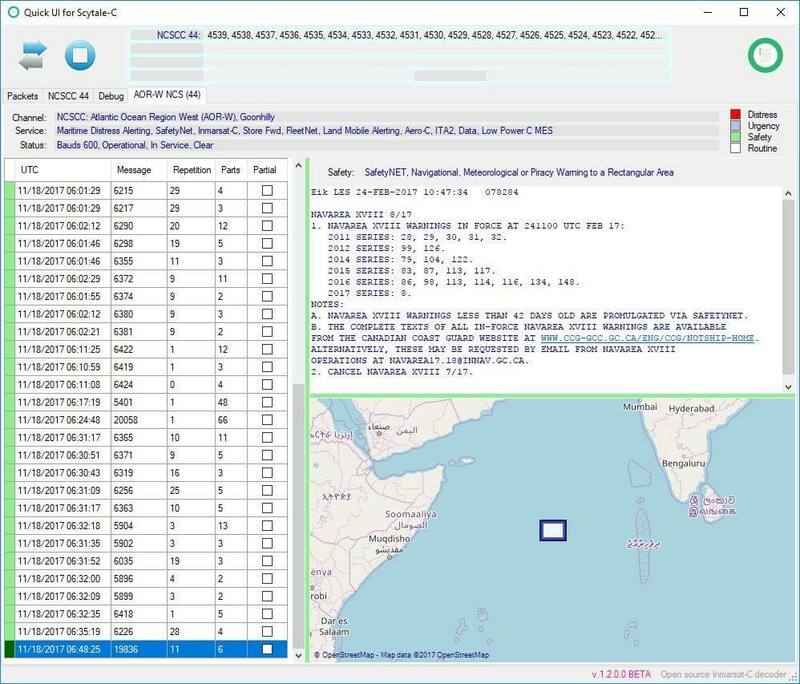 It is another solution of solving the problem of decoding the Inmarsat-C. Written from scratch. Inadvertently any Inmarsat-C decoder in the 1.5GHz band will have the same the building blocks and they are now documented in detail in the bibliography published with my code. The information is hard to find. All the information is from publicly available sources only. Such that the code will be able to withstand the obstacles or remaining open source. The majority of the documentation is technical manuals, as they each in part reveal a piece of the puzzle, and collectively they contain an almost complete communication protocol. Some are books and they must be the specific revision mention within the bibliography. Moreover if any coder will read the documentation they will actually be able to write a better decoder as I found parts of it too late for a more elegant code writing. And this is the whole idea of scytalec, that anyone can do it if they put their mind to it. There is enough documentation to tackle the C-band as well. And giving enough time, I might be planning on doing that after the sdr# plugin I’m working at. Not alone, as I was and I am being helped by others to which I am grateful and their names were and will be mentioned within the code. Just so you will have an idea of how deep the documentation correctness went for this project, even if a code comment was incorrect, say I was referring to a frame as a “block” or “part” I would get an admonishing email on that. So yes, I have high reasons to stand by this code originality. FACT REMAINS…Tekmanoid a greedy prick, Charging the scene money to do something ILLEGAL is a bloody joke, especially when it happens to you and you then complain. LAWL, always makes me laugh when script kiddies think the guy who did all the research, reverse engineering work, wrote a closed source program, then had his code stolen and turned into an open source project is the greedy one. Fact remains that even the free version of STD-C or inmarsatdecoder is leaps and bounds above the Tekmanoid or Scytale-C decoders in terms of performance at a given signal level. I run STD-C 24/7 and it just works, with an indoor homemade helical antenna, Inmarsat LNA and RTL-SDR into a Azulletech stick PC sitting on top of a baker rack, antenna pointing at the ceiling (signal comes through a concrete tile roofing, BTW). For days and weeks at a time til I decide to update Windows or reboot. Tekmanoid and Scytale struggle and mostly fail to stay locked on and decode with the same setup for even a couple of minutes. You get what you pay for. I keep looking at Tekmanoid with high hopes. The Tekmanoid interface is beautiful. Scytale is very interesting. Too bad the decoders are not better. I’m not so sure about that. Try France Telecom 121 LES around 1539.674. You’ll receive messages. It looks like Scytale-C only decodes public messages, so you still need a paid decoder for private ones.